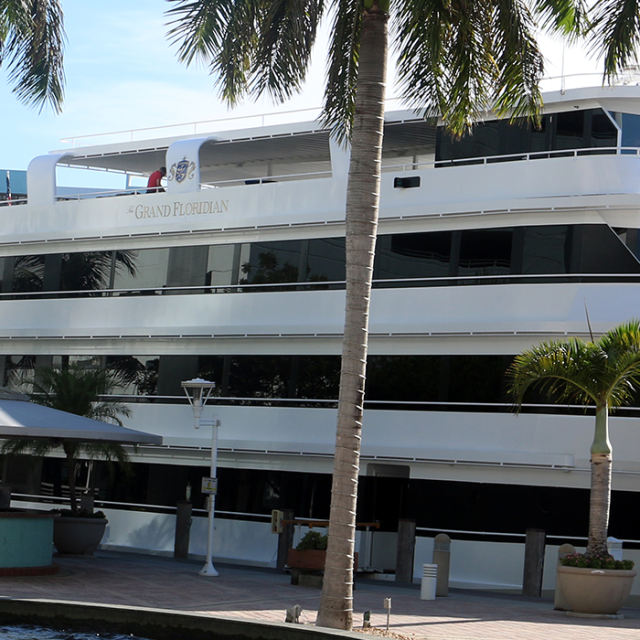 Home to more than 300 miles of navigable waterways, Greater Fort Lauderdale is both a destination and a journey for your group or meeting events. Whether your group is looking for a dinner cruise, a day of surf and sun, or leisure on the lido deck, Greater Fort Lauderdale’s fleet of more than 42,000 yachts, cruise ships, boats, and pleasure crafts are sure to have them descending the plank with stories they won’t soon forget. Greater Fort Lauderdale’s inland canals stretch from the Everglades to the Intracoastal Waterway and cover the natural beauty of mangrove forests and the man-made marvels of Millionaires’ Row on the New River adjacent to downtown Fort Lauderdale. Anticipation Yacht Charters boasts a modern fleet that can seat 120 to 350 passengers in comfortable surroundings. Their yachts—featuring state-of-the-art sound systems, plush carpeting, and elegant furnishings—are perfect for corporate events, dinner cruises, outings, and private parties. Groups looking to explore the open waters of the Atlantic can do no better than Air & Sea Palm Breeze Catamaran Cruises and Charters, whose 55-foot sailing catamaran departs from the Cove Restaurant & Marina in Deerfield Beach. Seating up to 300 guests, this multi-hulled watercraft cuts through the water for a stable ride that even the most inexperienced sailors can enjoy. Offering pleasure trips including sightseeing in Greater Fort Lauderdale, sunset champagne sailing, and full moon cruises, Air & Sea Palm Breeze is the perfect choice when planning team builders, employee rewards, client outings, or group excursions. For groups of all ages, arrange a trip on the Jungle Queen Riverboat. Their Spectacular Afternoon Tropical Isle Sightseeing Cruise is fun for the whole family and features a cruise through the Venice of America with stops at a tropical isle that houses monkeys and birds and alligators—oh my! Kids can hold a baby gator, pet an exotic bird, or enjoy refreshments from the Jungle Queen’s concession stand. The World Famous BBQ & Shrimp Dinner Cruise is all-ages fun after the sun goes down and features an all-you-can-eat menu and a crowd-pleasing variety show. To organize cross-city travel that avoids all the traffic, book all-day passes with Fort Lauderdale Water Taxi. More than just a novelty, this method of transportation offers your group a chance at leisure and sightseeing while delivering them to 15 major stops throughout Greater Fort Lauderdale. Guests can stop off at the beach for a swim, see the cruise ships at Port Everglades, and stroll the streets around Las Olas Boulevard, confident that a comfortable ride on the smooth waters of the Intracoastal is always close at hand. There are two can’t-miss events worth scheduling your group’s visit around: the Winterfest Boat Parade and the Independence Day Fireworks on Fort Lauderdale beach. Both events bring out Fort Lauderdale’s fleet of pleasure crafts, and the best spot for viewing is on the water. Known as the Greatest Show on H2O, the Winterfest Boat Parade kicks off Greater Fort Lauderdale’s holiday season and brings more than a million visitors to the waterfront, giving your group a chance to be part of the festivities by chartering a vessel sailing in the parade. While most July visitors to Greater Fort Lauderdale will watch the Independence Day fireworks from the beach, your guests can avoid the crowds and get closer to the action by spending the evening out on the water.